At 10:47 am, a few minutes after Tanker 57 was dispatched to transfer to Kinzer FC, the pre-alert went off for a barn fire in our first due at 819 Buck Road in East Drumore Township. 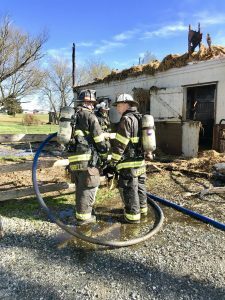 Units responded and could see smoke from the borough and requested the “working fire dispatch”. We also knew that this was one of our members properties. 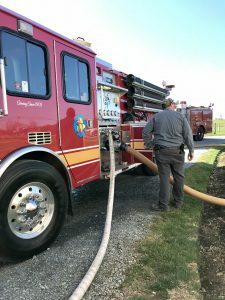 On arrival, Engine 574 laid 300′ of 4″ supply line in the driveway and the crew stretched a 2.5″ and a 1.5″ line and protected exposure and attacked the fire, knocking the bulk of it quickly with the 2.5″. 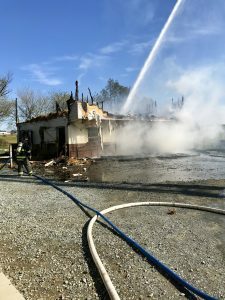 Crews then switched to the 1.5″ and knocked down most of the interior fire. 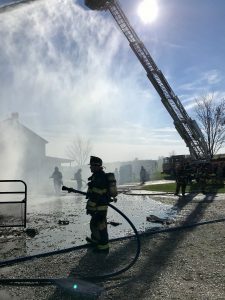 Once mutual aid units arrived with additional tankers, Truck 57 put the ladder pipe in service and finished up with final extinguishment. 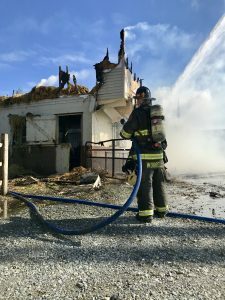 Damage estimates are about $50,000.00 in fire loss, but the concrete block base of the 40’X40′ barn was saved. Thanks to all of the mutual aid units that responded and to the QFD Special Division for the refreshments. The Company was in service just over 2 hours.